I told this story before, but I recently recalled a part of the story that I neglected to pass along before. One of my first girly moments was related to the ballet. When I was 5-years-old, my mother enrolled my younger sister and I in a dancing school. My class had about 15 girls and one other boy. Once a week, we practiced tap and ballet for an hour under the tutelage of young female instructors. I have no memory why my mother enrolled us at dancing school. I could understand enrolling my sister, but why did she immerse me, her only son, in that world of femininity? It certainly was not going to make a man out of me. Maybe she detected the girl in me and thought that I would enjoy participating in such a girly activity. If that was her plan, she was correct. I enjoyed every minute of it! I loved learning dance and being treated like the other girls. The young instructors became my role models. I even recall dreaming (both day-dreaming and sleep-dreaming) about dancing as a ballerina, wearing a pink leotard, tutu, ballet shoes, and makeup with my long blond hair put up in a pony-tail. In the spring, we had a dance recital. It was held at the Loew's Poli Palace theater in Waterbury. "Registered as a National Historic treasure, the Palace's elegant lobbies, crystal chandeliers, gold detailing, almost 3,500 seat capacity auditorium, along with its Broadway-sized stage, make this the largest seating capacity theater of its kind in all of New England" when it was built in 1922 (Source: Cinema Treasures). So my first (and last) appearance on stage was big time! Since we were appearing on stage, we had to wear makeup. My mother was my makeup lady, but she knew bupkis about stage makeup. So when she applied our makeup, she made my face up just like my sister's face – lipstick, rouge, eyebrow pencil, eye shadow, mascara – the works! Although I was wearing a boy's costume, I had the face of a girl! Due to tight family finances, we only took dance classes for one year, but that one year immersion in femininity left a life-long impression on this girl. 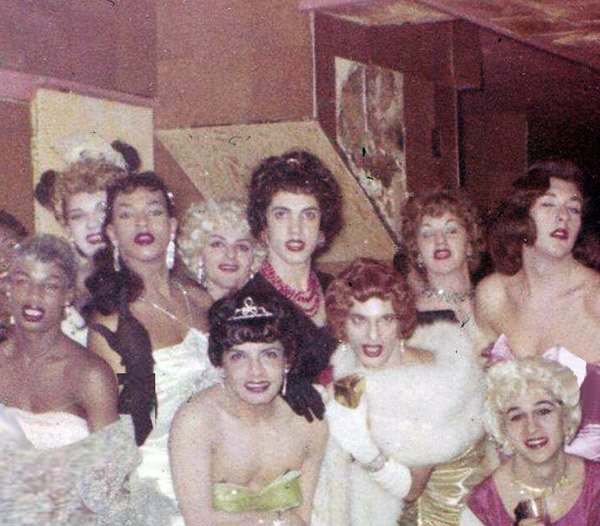 Femulators partying in the 1950s. It is too bad that there are no photos of your debut on the big stage. There are home movies of my sister and me practicing at home in costume, but without makeup. There is also a newspaper photo of us on the Palace stage in costume and makeup, but the photo lacks the detail necessary to make out who is who.